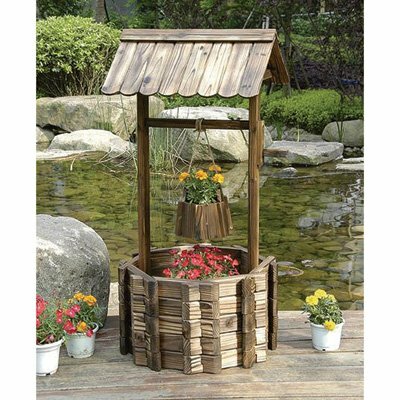 If your wishes have been limited lately to mundane aspirations, this grand wishing well planter will change your life.The perfect place to wish for world peace, sunny weather or good luck, this beautiful structure comes under the heading of Extraordinary Enhancement to any garden, yard, deck or patio. The rustic-looking burnished fir wood construction features a planter bucket suspended on a rope, as well as a generous planter base, so you have plenty of room for your favorite flowering plants. 23.62in.L x 21.65in.W x 44.88in.H. Easy assembly. Aquaphoric Herb Garden Tub - Self Watering Passive Hydroponic Planter + Fiber Soil, Keeps Indoor Kitchen Herbs Fresh and Growing for Weeks on Your Home Windowsill. Compact, Attractive and Foolproof.